What’s the easiest way to get longer and thicker looking lashes without mascara, eyelash extensions, or a growth serum? Lash perms AKA lash lifts are probably my favorite “fast results” treatment and it lasts a month! I have thick eyelashes that are stick straight. I use an eyelash curler every day otherwise I look tired and just kind of eh. So when I tried my first lash perm in 2014 I was immediately sold. Even though the process is a little uncomfortable and long it is nothing compared to eyelash extensions. You need about an hour to get a lash lift- not the 3.5 hours my eyelash extensions took (who remembers that fiasco? haha). *Thank you Beauty By Dolly for the amazing complimentary treatment! If you are in San Diego I 100% suggest you go to them! How do lash lifts work? Lash lifts are very similar to a perm you’d get on your hair. Same smell and all. They use chemicals that break down the bonds in the hair so you can reshape them with a curl. 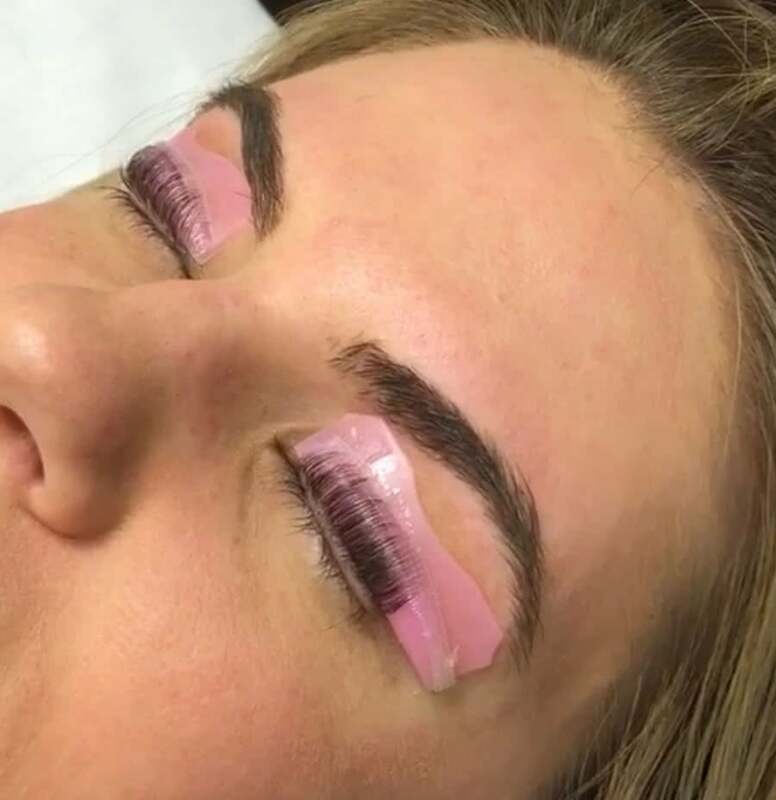 Just like with eyelash extensions, you lay down with your eyes closed for a while. *Warning* if you get claustrophobic or don’t like things touching your eyes then this treatment is not for you. You have to be able to lay still with your eyes closed for an hour and it’s harder than it sounds. They brush glue onto your lids so the reshaper pad will stick. This glue is similar to eyelash glue for fake lashes, but not as sticky. The glue also acts as a protectant to your skin. After the glue they apply the pad right above your top lashes and stick it to your eyelid. I really liked how they customized the shape to my lash length. I’ve had lash perms where they use a pad that was too small and my lashes ended up being way too curly. Next, the first solution is applied to the lashes. This product breaks down the bonds of the hair. 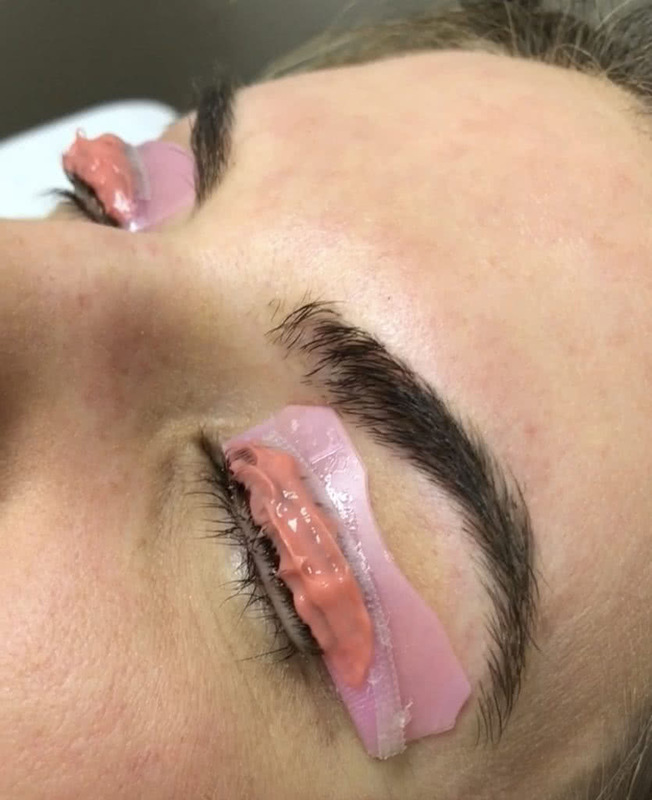 Once these bonds are broken, you can reshape the lashes to the shape of the pad. This solution takes 15 minutes to do its job. After the 15 minutes, the second solution (the activator) was brushed onto my lashes. The activator rebuilds the broken bonds, locking in the new shape of the lashes. The lashes are brushed and shaped around the pad to form the ideal curve. This also takes 15 minutes. This process shouldn’t hurt at all. The products they use aren’t applied directly to your lash line, so any discomfort will be more from the hair bending in ways it’s not used to (like when your ponytail is too tight and you get that pain where the hairtie is). After 15 minutes the solution is wiped off and they remove the pad from your eyelid with vitamin E oil which is soothing and hydrating (it feels SO GOOD). Then the lashes are combed apart and you’re all set! Just like with a perm for your hair, you cannot get the lashes wet for 24 hours after the treatment- that includes wearing mascara. If you get your lashes wet before the 24 hours are up you will likely de-activate the curl and the curl will collapse. The curl from the lash perm should hold for about a month. 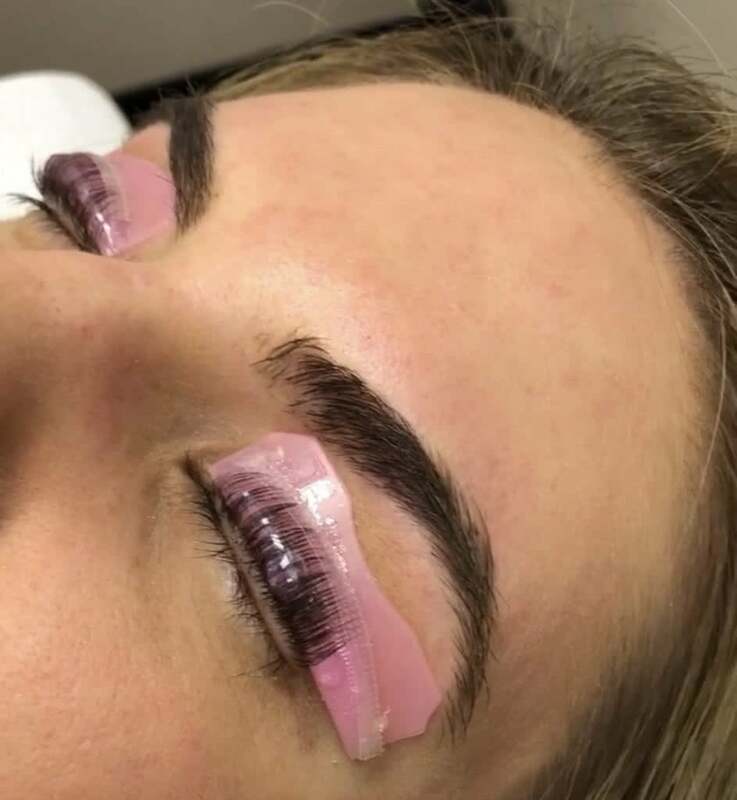 And this treatment should not be done more than once every four weeks because the process breaks down the structure of the hair, so it can be really drying for some people and make your lashes feel brittle. Are you a good candidate for a lash lift? Do you have straight lashes? Or wish your lashes had more curl? Do you like to wear oils in your skincare and makeup routine? Do you like to rub your eyes? Did you hate eyelash extensions? If you said yes to any of these questions then you are definitely a good candidate for this treatment! 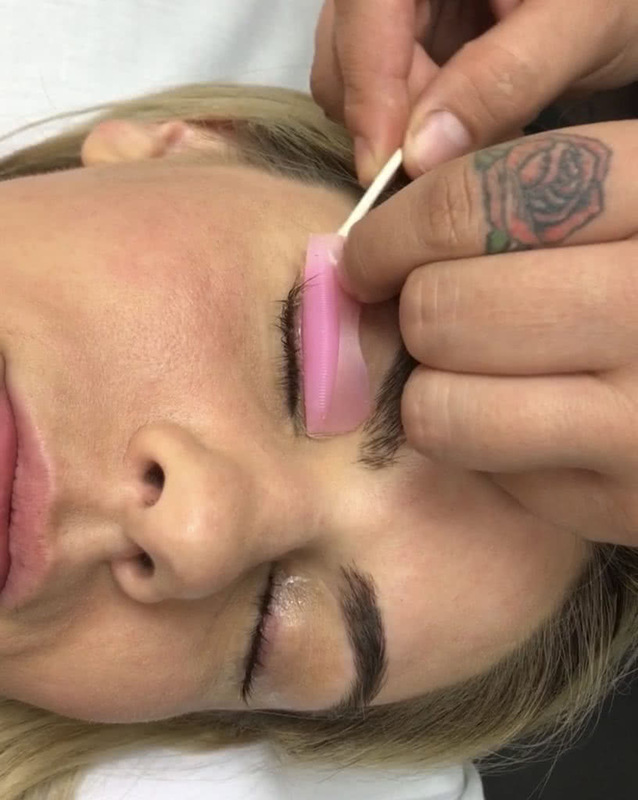 Have you ever tried a lash lift? What did you think? Thanks Lauren! 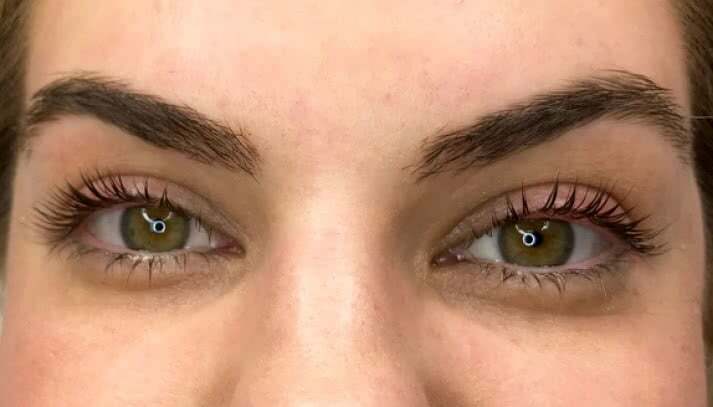 I’m definitely going to try a lash lift!